Your passwords are horrible. You should do a better job, but keeping track of tons of unique alphanumeric cyphers is a pain, and password managers come with their own inconveniences. Luckily, it looks like future versions of Google Chrome will have built-in features to help you do better. Hey, so, it&apos;s Change Your Password Day. Which means you should like, change your password. According to documentation on the Chromium Projects site, the development team is planning to introduce a password generator to future versions of Chrome. The exact design for the way new feature will work hasn't been ironed out yet, but it will essentially take the place of password manager, for everyone who uses one. 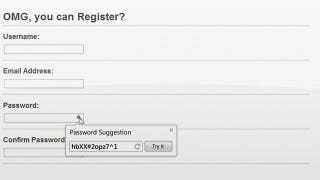 When Chrome detects that you're filling out a form on a registration page, the browser will prompt you with the option to generate a password out of random letters, numbers, and symbols. At that point, all you have to do is store the password with Chrome, which will sync it on to all of the computers you use.